Job seekers can send in an Apple application on the company’s online careers portal for a chance to work for one of the most successful companies in the world. Founded in 1976 by Steve Jobs, Steve Wozniak, and Ronald Wayne, Apple is currently the fifth company on the Fortune 500 list. With more than 478 Apple stores located in 17 countries and as many as 115,000 employees worldwide, Apple is one the most eligible employers out there. The typical Apple store hours are 10:00 A.M. to 9:00 P.M., Mondays through Saturdays and 11:00 A.M. to 6:00 P.M. on Sundays. However, these may vary from one location to another. This is why they should check the schedule of the store they are interested in on the Apple store locator. Customers can use the Apple media line available for the United States is (408) 974-2042. They can find the company’s complete contact information on their Contact page. The Apple hiring policy dictates that all candidates for employment must be at least 18 years old to be considered eligible for their chosen positions. Please note that younger job seekers will be automatically eliminated from the employment process. They are advised to apply for the student programs instead. Job seekers interested in Apple employment can find all the job opportunities on the company’s online careers portal. They can search for the ideal position for them by selecting their preferred location and career department. Then, they can find the complete list of job requirements and responsibilities in the descriptions of the positions. When they find a position that is in line with their expectations, they can be considered for that position by filling out the online jobs and employment form. To do so, they are required to set up accounts on the Apple application portal. They will be asked to provide their e-mail addresses and their contact information to create the accounts. Then they can begin to fill out the Apple job application form, which they can submit online. The Apple job application form is quite concise; it requires candidates to provide the most important details about their professional and academic backgrounds. We will provide them with a detailed description of the form so that they can make sure to have all the required information ready. This is the first section of the Apple job application form. Candidates will be asked to provide specific details about themselves. This information will be used for statistical purposes. Please note that candidates are not obligated to provide the requested information. If they do not feel comfortable disclosing the type of data, they can select the “I choose not to disclose” answer. The outcome of their applications will not be affected in any way. For this part of the Apple online application form, candidates are asked to disclose their gender, race, and ethnicity. The information will be used to create a better profile of the applicants interested in Apple careers. 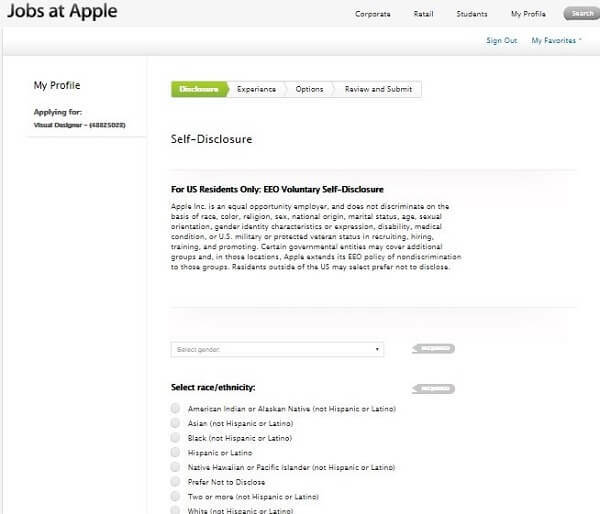 Candidates are asked to disclose personal information about themselves for this section of the Apple application form. 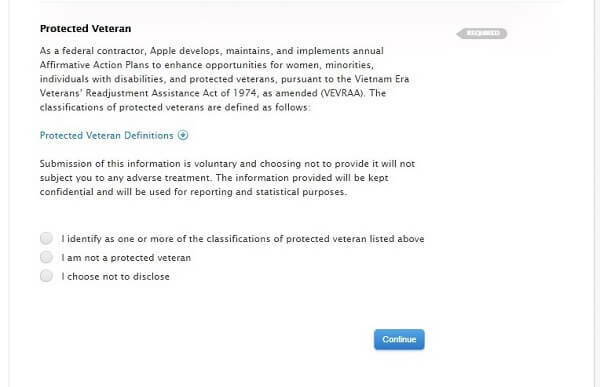 Candidates are asked to disclose their veteran status as part of the Apple application. Please note that this is entirely optional. Candidates are asked to disclose their veteran status for this section of the Apple application form. 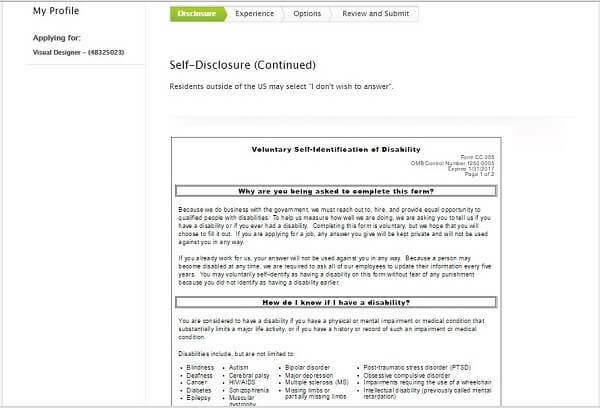 This part of the Apple job application form requires candidates to disclose any disabilities they might have. The information provided by job seekers will be used to determine Apple’s ability to provide equal employment opportunities for the disabled. Candidates are asked to disclose their disability status for this section of the Apple application. 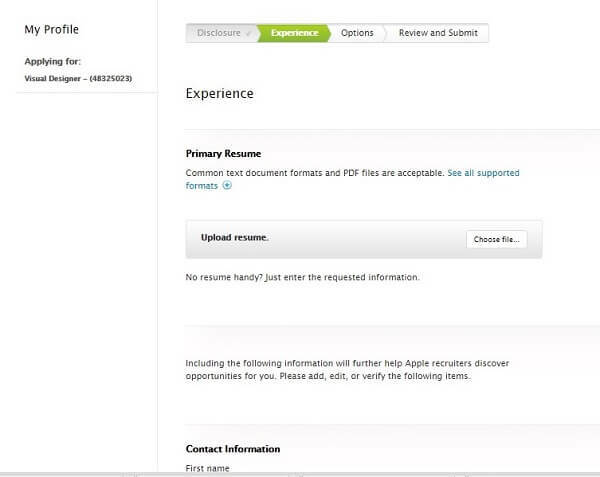 Candidates can upload their resumes to this section of the Apple application form. Their CVs will then be attached to the form. Candidates can upload their resumes for this section of the Apple application. Job seekers must provide their complete contact information for this section of the Apple application form. This will be used by the Apple hiring specialists to identify them and to contact them about the upcoming parts of the hiring process. This section of the Apple job application form requires candidates to provide an overview of their education. They will have to include a separate entry for each program they have been a part of. Candidates can include information about their professional and academic experience for this section of the Apple application. For this section of the Apple application form, job seekers will have to create a summary of their work experience. They are instructed to begin with the most recent position they have had and to continue to list the others in reverse chronological order. 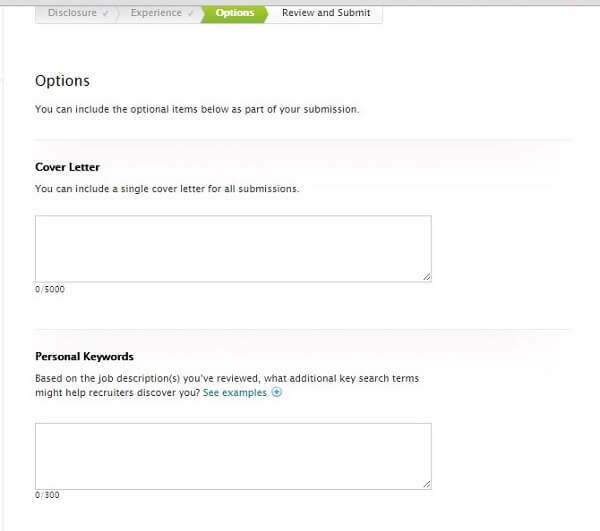 Candidates can add their cover letters to the Apple job application form. This will provide the Human Resources specialists with additional information about them. Candidates can upload their cover letters to this section of the Apple application. 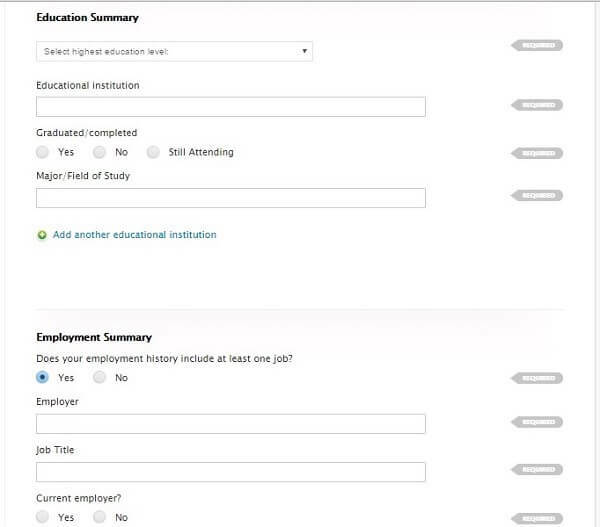 For this field of the Apple application form, candidates are instructed to include the specific keywords that could lead the hiring specialists to them. An example is provided on the portal (“project management, SQL, customer service, metrics, analysis”) to help guide them. Then they will have to think of the key phrases that would represent them. This section of the Apple job application form requires candidates to include information about the languages they speak and the proficiency levels they have achieved in each of these. This type of skill could prove to be very important for the hiring process. For this section of the Apple application, candidates can include information about their skills. Candidates are required to include their areas of professional interest for this section of the Apple application form. They will be able to select these from the list provided on the portal. For this section of the Apple job application form, candidates will be able to choose the type of position they are interested in. They can choose between full-time Apple careers, part-time positions, and intern/ Co-op programs. 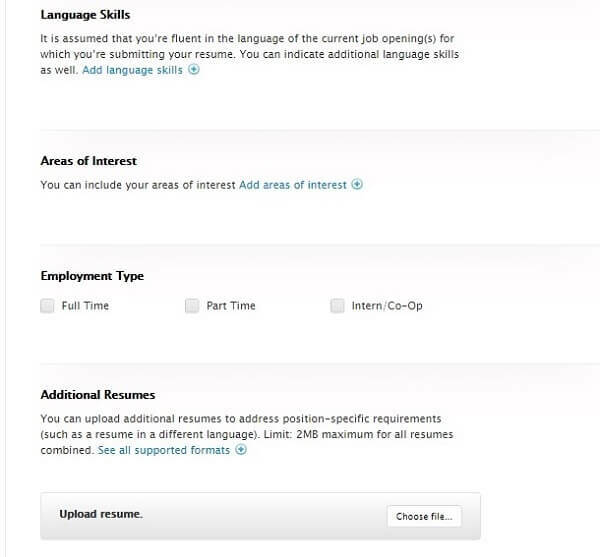 Candidates can add a second resume, such as a resume in a foreign language, to this section of the Apple online application form if this is one of the requirements listed in the description of their chosen position. This is the final section of the Apple application form. The candidates will be able to see their completed job applications so that they can correct any mistakes that they might have made while filling out their forms. After they complete their reviews, they can send in their Apple job applications to the Human Resources department for the formal assessment. They will be able to keep track of their application status on the careers portal to find out when their forms have been analyzed by the hiring specialists. The Apple careers portal includes all the job openings available at the company. Candidates should check the portal periodically to find the best-suited positions for their experience. Sales specialists interact with the customers in the Apple Store. They will help them find the best possible products for their needs, as well as the best offers to provide them with the best possible Apple experience. Apple salaries for sales specialists vary between $11.00 per hour for new employees to as much as $19.00 per hour for experienced associates. They are also entitled to generous Apple employee benefits packs. Job seekers can find the complete list of available Apple careers on the company’s employment portal. They will have to select their preferred location to find all the openings in their area. Then they will have to fill out the online application form to be considered for their chosen positions. Healthcare Apple Benefits: Medical Plan, Dental Plan, Vision Plan, Paid Prescription Coverage. Financial Apple Benefits: Competitive Apple Salaries, Employee Stock Purchase Plan, Retirement Plan, Stock Options. Retirement Apple Benefits: Pension Plan, 401(k) Plan. Insurance Apple Benefits: Basic Life Insurance Plan, Supplemental Life Insurance Plan, Disability Insurance Plan. Paid Time Off Apple Benefits: Paid Holidays, Sick Days, Bereavement Leave, Paid Vacation. Special Apple Benefits and Perks: Apple Employee Discount, Mobile Discount, Gym Membership, Periodic Computer Checks, Tuition Assistance Program, Job Training, Professional Development Options. Compared to other employment forms, the Apple online application form is very concise. Job seekers are only required to provide the main details about their professional and academic backgrounds. This is why it is very important that they take the time to fill out as much of the form as possible, including the fields which are optional. It is also very important that they attach their resumes to the forms, precisely because this could provide the Apple hiring specialists with detailed information about their professional experience. Moreover, they should also include a cover letter as this would enable them to personalize their employment forms. They should focus on the personal traits that make them solid candidates for Apple employment, rather than simply listing their work experience again. Before submitting their Apple applications for assessment, candidates should take their time reviewing their forms. It is very important that they check for spelling and grammar mistakes, as these could present them as unprofessional. They should be particularly attentive with their contact details because their contact with the Apple hiring specialists depends on them. All the Apple applications will be assessed by the company’s hiring specialists. They will determine whether or not the candidates are suited to comply with the responsibilities of their chosen positions. All the selected candidates will then be called in for the interview process, which could include up to four job meetings depending on the particulates of the Apple department sought by the candidates. They will be notified about the development of the interview process when they will be contacted by the Apple hiring specialists. This will help them be properly prepared for each job meeting. Candidates preparing for Apple interviews are advised to make their research about the company’s development. While Apple is one of the best-known brands on the technology market, candidates may not know enough about the company to impress the hiring specialists. It is very important that they are able to present their opinions on the company’s products and brand image, but they should also know their facts. This will prove to be extremely useful for providing high-quality interview answers. When interviewing for a company as popular as Apple is, it may not be enough to be well prepared with the main facts for the job meeting. Job seekers should also have a memorable look that is in line with their personality and skills. We advise candidates to complete their formal outfits with the proper accessories to stand out during their job meetings. The Apple employment specialists will appreciate them taking the time to prepare their looks for the interview. Candidates can use the sample Apple interview questions we have provided to practice their interview answers for the job meeting. This can actually improve their performance during the meeting, which is why we strongly advise they do not skip this step. Why have you applied for Apple employment? What do you think makes you a solid candidate for Apple employment? What do you know about Apple? What is your favorite app? Why? Could you please tell me about a time when you have dealt with a difficult customer? How did you manage the situation? What can you tell me about yourself that is not included in your Apple application?